There are many students in the School District of Niagara that go home on weekends and holidays with not enough, if any, food to get through these days. While we already provide lunch and breakfast for these children, we are unable to provide for them while they are not at school. Until now. We need your help to fill our Badger Backpack Program. This is a program based on your donations to send food home with these children. Children will be given two breakfasts, two lunches and two snacks along with a can of fruit or vegetables to help reduce their hunger over the weekends and holidays. You can help by making a donation of non-perishable food (mac and cheese, oatmeal packs, fruit cups, soup, etc.) or giving a monetary donation to the program. Your support is key in solving this problem. 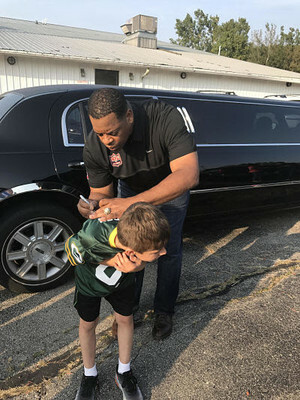 Former Packer, George Koonce mesmerized his audience at the M&M Area Community Foundation Tailgate Fundraiser on Thursday, September 14. The football great, and doctor, described life during and after football, as he shared the important life lessons he learned throughout his journey. People’s generosity is always appreciated and no gift is considered to be too small. Whether an individual wishes to donate $5 or $50,000, MMACF’s endowed funds ensure there will always be financial resources available to meet the community’s needs. The Community Foundation works to match a person’s interests with a nonprofit organization, which addresses that particular cause. Community members interested in giving back are encouraged to contact the MMACF at 906-864-3599. We are in need of plastic or paper bags. You can hang them on the door of Badger Backpacks or give them to Sarah Zychowski. THANK YOU! One of our volunteers, Mr. Ed Laarman, delivering two of the more than 60 bags distributed each Friday for needy students, providing nutritious meals for over the weekend. Thank you to our volunteers who make this program possible! Not only does Badger Backpacks support getting kids healthy on the inside. We support the whole child by providing reading level books to each student who receives a weekly backpack. If you have gently used books around your house, consider donating them to Badger Backpacks. Congratulations!!! Mrs. Johnson's second grade students were the winners of the Badger Backpack Can Drive with 60 cans! They will receive a pizza party for their contributions.Way to Go! !